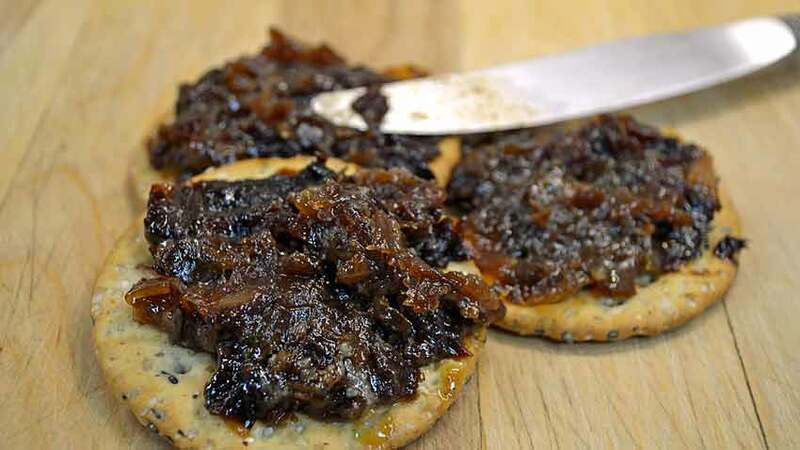 Slow cooked caramelized onions are great, but what if you took that further? Like, a lot further. 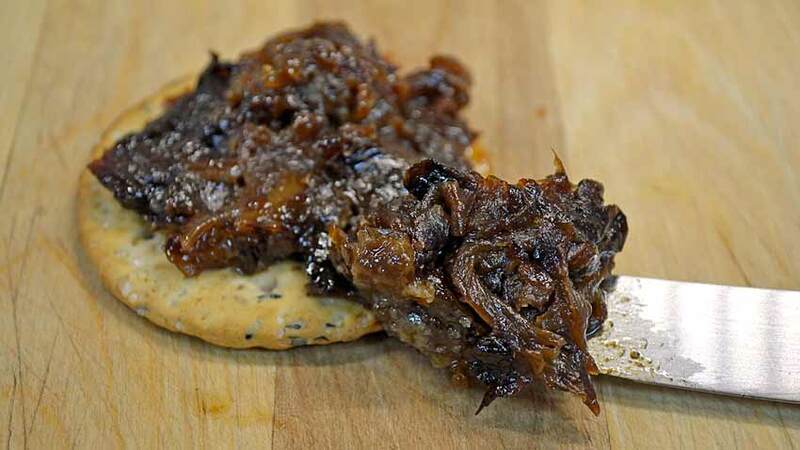 Say, six hours full of slow cooked, caramelized goodness. You would wind up with what Chef Michael Solomonov makes at Zahav, his Israeli-inspired restaurant in Philadelphia. 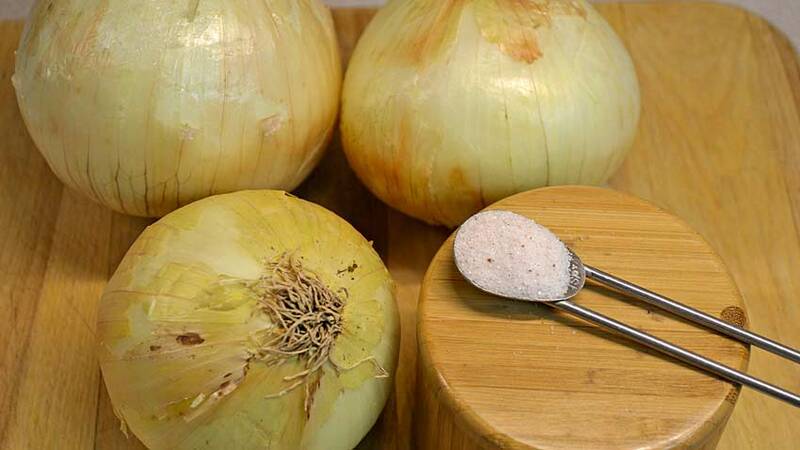 Place the onions in a heavy heat-retaining pot. I’ve used cast iron for over 20 years and haven’t found anything better for this type of cooking! 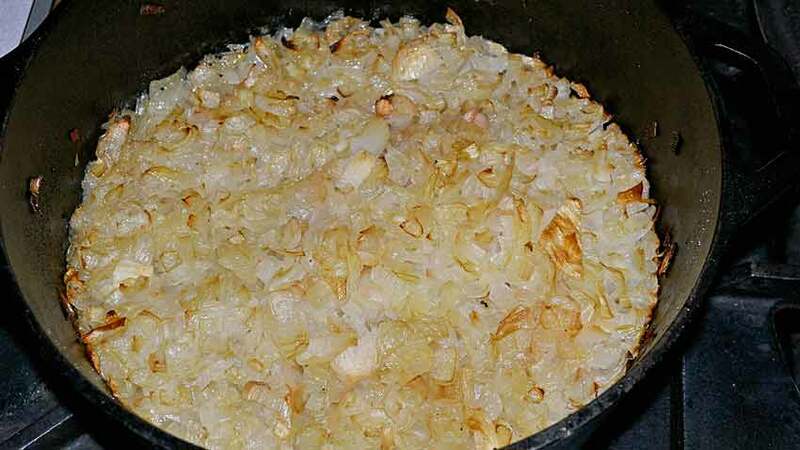 Pour the olive oil over the top of the chopped onions, then sprinkle the sea salt and stir well. 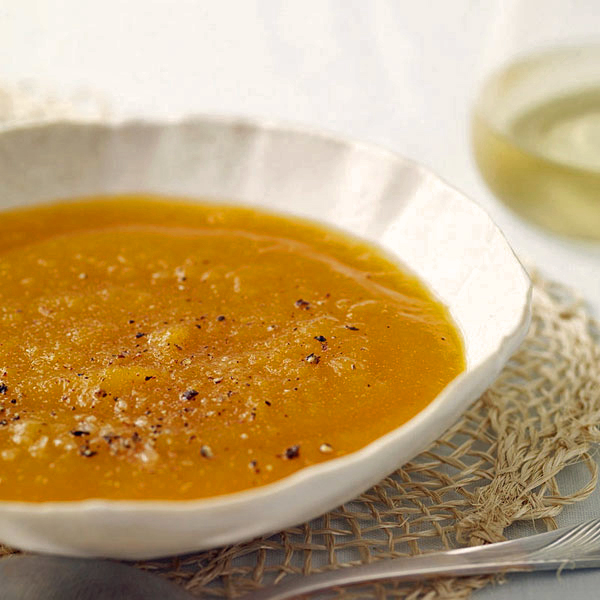 Here’s where the magic happens – for the next 6 hours, you will cook this very low and slow. During the summer (when I wrote this) I do a lot of cooking outside on our Kamado, a Japanese ceramic grill fired by charcoal. 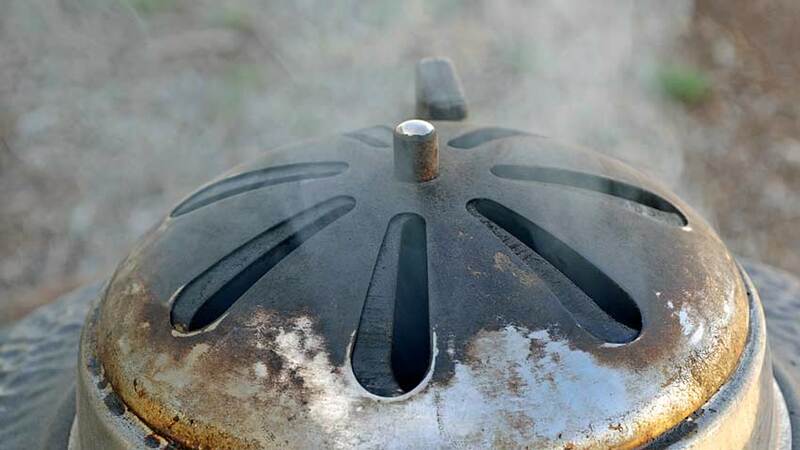 I use native mesquite charcoal and keep the temperature to around 250°F with a volcanic heat diffuser stone just above the charcoal for indirect heat. The mesquite gives a really nice, intensely smoky flavor without being bitter or over the top. Yes, it truly does take 5 – 6 hours for the full flavors to develop. 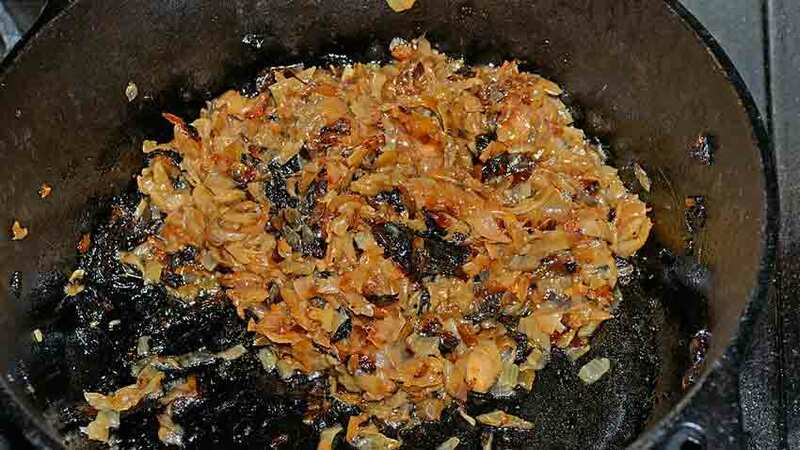 You can caramelize the onions faster with higher heat, but will miss the incredibly complex flavors – starting with a deep, rich and sweet note, a quick hit of smokiness, then moving to blackberries or dried cherries, followed by balsamic vinegar sweetness and finishing out with more long, lingering smoke. 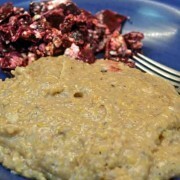 The first time someone tastes this, they think it’s a very complex spread and are surprised at the 3 ingredients. Let’s walk through how to make this yourself! Chop the onions into smaller pieces. 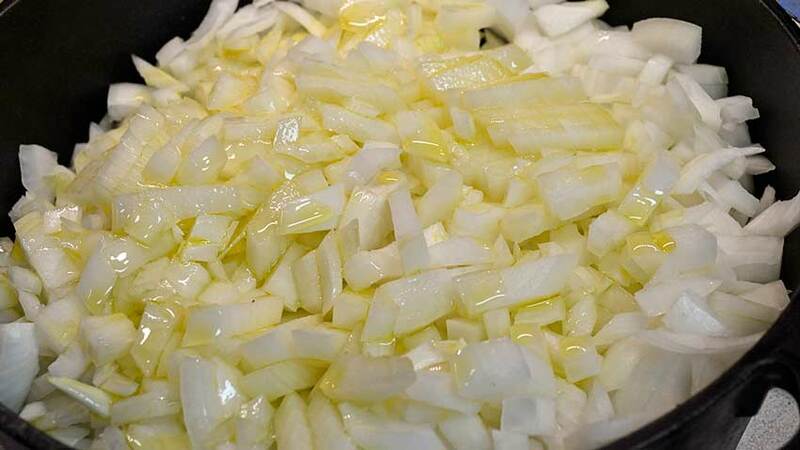 I love using sweet onions as they add a layer to the flavors, but any mild onion will work well. Of course, growing your own onions will give you the absolute best flavors, but a close second is your local Farmer’s Market. 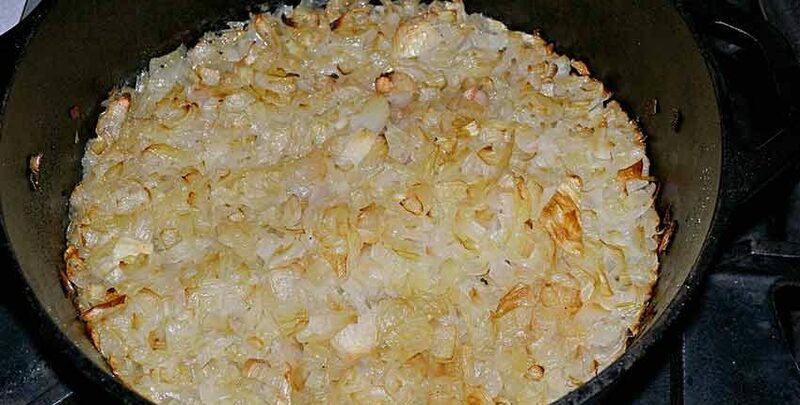 Look for the large, fat, sweet onions for this recipe. 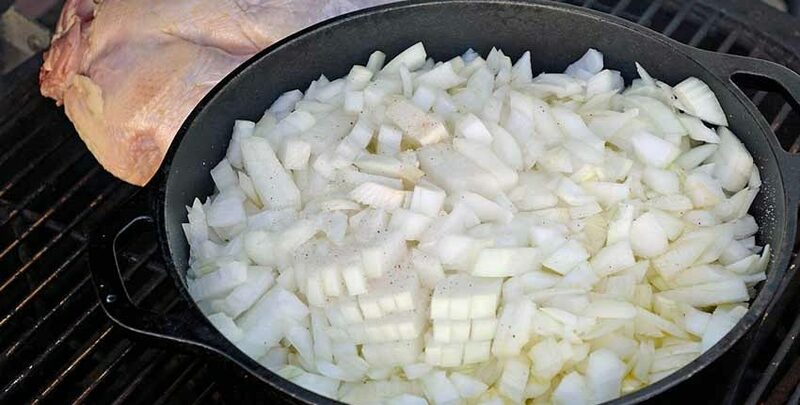 Yellow or sweet onions give excellent flavors, but red or purple onions will do just as well with a different color and flavor. Early fall is a great time for planting onions to over-winter and finish growing next spring – giving you an extra dose of rich flavor and sweetness. 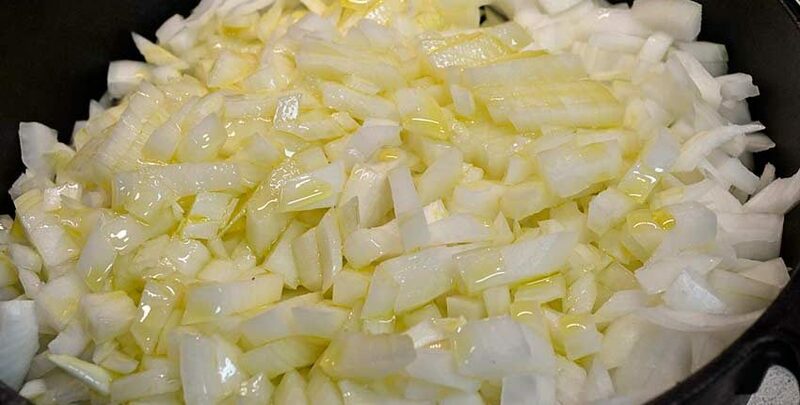 Add the chopped onions to the pot, add the olive oil and salt, then give a good stir to coat the onions. 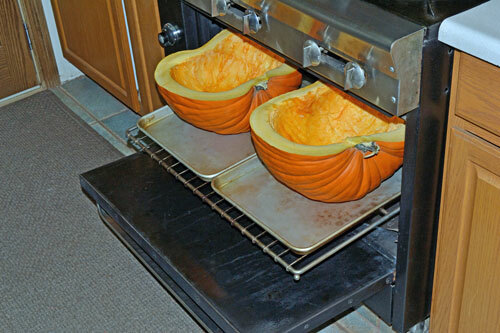 Put on the covered grill or oven set to 250°F. The pot of onions has just been put on the Kamado, where I was pre-roasting a chicken for a clay pot dish with onions and Poblano chiles. Note how full the pot is – within a half inch or so of the top. As we progress, you’ll see how much this drops! Smoking means cooking! 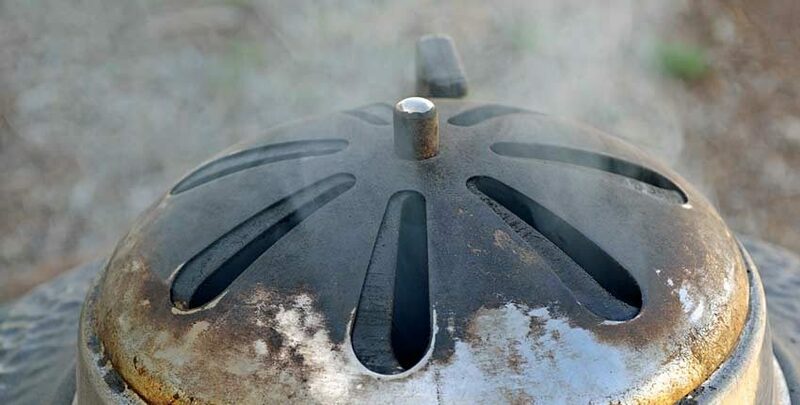 The smoke always means a delicious meal is on the way. The beauty of slow cooking outside is the freedom it gives you. There is no need to stand around the grill, you can do projects, read or take a nap and check the progress every so often. I try not to lift the lid more than twice an hour, to not lose heat and smoke. 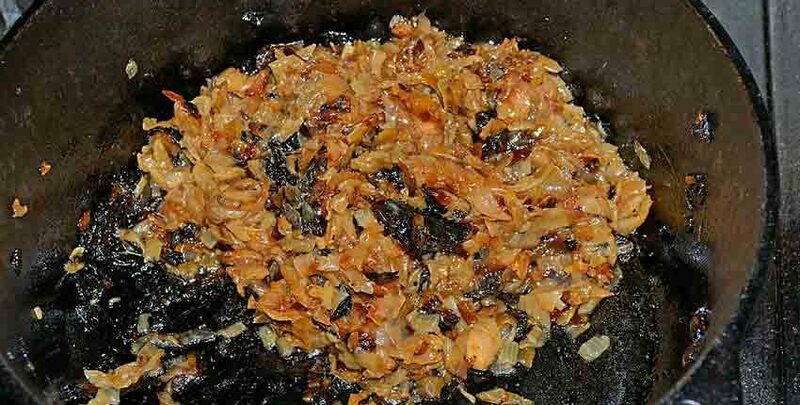 After a couple of hours the onions begin to caramelize. Give them a stir at this point, then about once an hour. See how much the level has dropped? 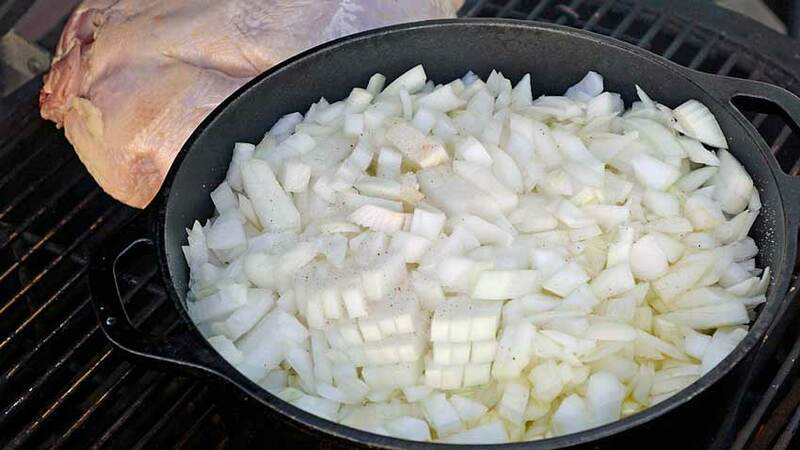 The lid is left off so the moisture evaporates and the smoke can infuse the onions. No, these aren’t burned – they are finished! What started out as a full pot has cooked down to just a couple of cups. 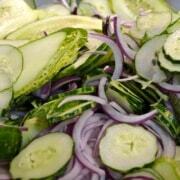 All of those flavors have condensed and intensified, mellowing with the gentle heat and smoke from the grill. 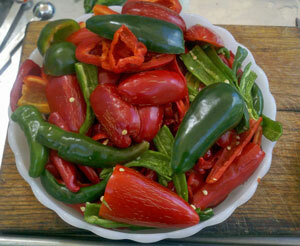 Remove from the pan, let cool and store in the refrigerator for up to a month. They won’t last past a few days, but they will keep up to a month! 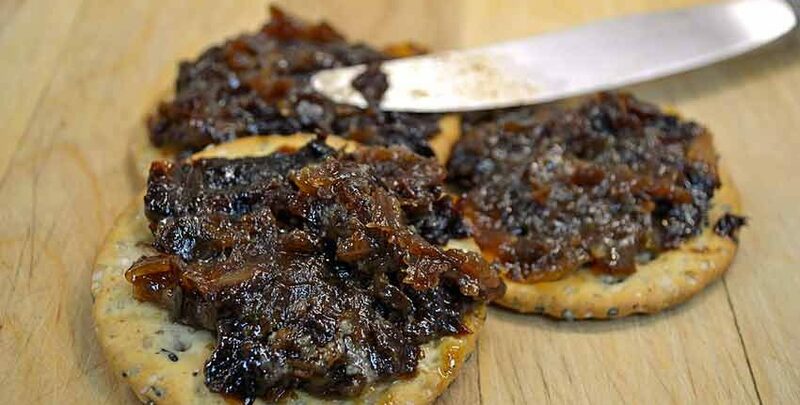 Now that you’ve got some smoky caramelized onions, what do you do with them? They are delicious as appetizers straight on crackers, spread on the bun of a fresh-grilled hamburger or as a remoulade on a steak. Mix half-and-half with our 30 Second Mayonnaise for a sandwich spread that will amaze! 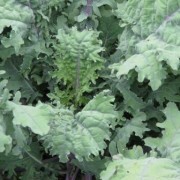 Chef Michael serves them mixed with salads, slathered on roast chicken, spread on toast with ricotta cheese, or swirled in sauteed chopped collard greens as a rich side dish. 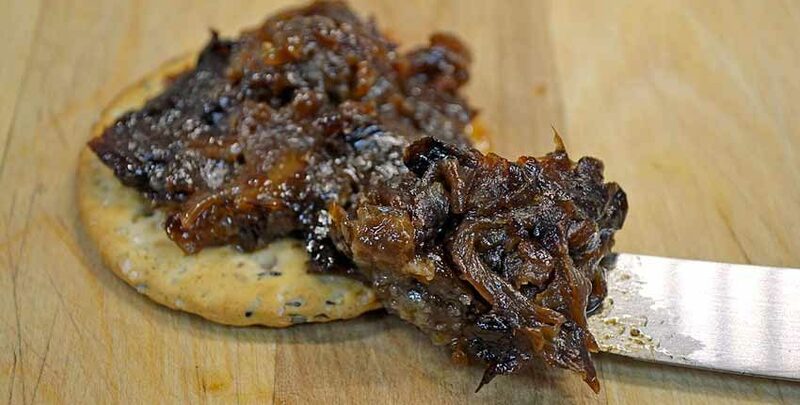 I like them straight, spread on crackers for that full blast hit of flavors and smokiness. Spread on burgers is sublime as well. Give this a try and let me know how you like them and what you use them on!